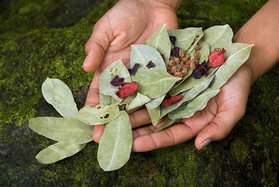 Daintree Essentials range of skincare for face and body incorporates the principles of aromatherapy, colour therapy, phytotherapy and thalassotherapy in combination with local Kuku Yalanji Aboriginal principles aimed at balancing the five elements of earth, water, fire, air and ether. All elements are combined in the products so you can perform your own healing treatments in the salon or at home, using the products intuitively designed, so that the body may receive the balancing that it requires on any particular day. The pure spring water, sourced directly from the Daintree, is the purest water in Australia. Incorporated in nearly all of the Daintree Essentials range (excluding our pure organic oils), this water provides minerals and hydration to the cells. The range is unisex, therefore suitable for both Men & Women.